A database of tourist mines and caves has been created to investigate the requirements of an integrated monitoring system with the aim of ensuring the safety of visitors and preserving the environment of the activities. It contains the main features of each site, in particular the physical, geological and technical information. The results unfold the main characteristics of these sites and give an insight of the parameters to be monitored: number of visitors, temperature, noise, gas concentrations, ground movements, among other factors. All these features are crucial for the safety of tourists and guides, as well as for the preservation of biodiversity and geodiversity. This information will be used to create a system capable of controlling the entire underground activity, such as the one tested in the two case studies. Sanmiquel, L., Alfonso, P., Bascompta, M., Vintro, C., Parcerisa, D., Oliva, J. 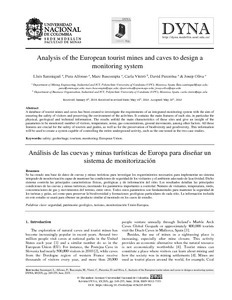 Analysis of the European tourist mines and caves to design a monitoring system. "Dyna (Medellín)", 2018, vol. 85, núm. 205, p. 249-255.